Returning driver Charles Ng led new race outfit G.Harry Racing Team to their first ever race win in the Asian Touring Car Series today. The Hong Kong driver finished the ten lap race in a total of 25:08.974 minutes, just two seconds ahead of Lui Man Kit. Lui set the pace during the Qualifying session but could not fend off the young driver. Lui returns to the series along with fellow Macau race regular and teammate, Mak Ka Lok who claimed the final spot on the podium for RPM Racing. 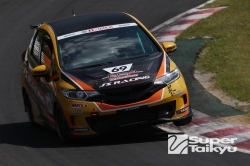 In round 2, Macau driver Lui Man Kit climbed onto the top step of the podium for the second time today after winning Round 2 of the Asian Touring Car Series race at Sepang International Circuit. Luiâ€™s Round 2 win places him in the lead of the Asian Touring Car Series Championship leaderboard with 27 points. The Macau driver leads his teammate and compatriot, Mak Ka Lok, who finished third in round 2, by 5 points and will be looking forward to creating a bigger gap by the next race. "I had a good weekend. I learnt from the mistakes in Race 1 and ensured myself a win only if I could secure a good lead and I did. I pushed hard from there on right till the flag was out," said Lui. Mak was somewhat disappointed at not being able to make it a 1-2 finish for RPM Racing "I had a transmission problem which caused me to have difficulties shifting gears. I could only hold on until the seventh lap and slowly I began losing time which allowed Chai to close in on me," said the Macau driver. Malaysian outfit G.Harry Racing team co-owner and driver, Harry Chai said of the weekend, "we finished on the podium twice this weekend and that is important to show that we are a team made to win". Chai claimed the second podium for the team when he finished second in Race 2 after overtaking RPM Racingâ€™s Mak Ka Lok at the final corner. "It will be a tough season and this weekendâ€™s races is proof of it with close racing throughout the race," said ATCS regular, Chai. The Asian Touring Car Series will return to Sepang International Circuit on 25-27 June for Rounds 3 & 4.